Last week was a bad week for me. My brain was not working at all. It was all due to fibro fog and perimenopause fog. What happened – the fire alarm happened. Beeping fire alarm on the ceiling. 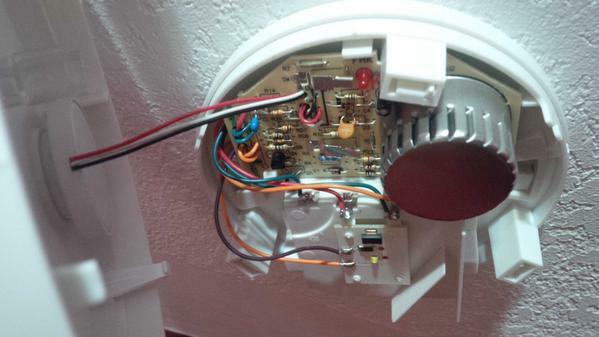 The day before I turned 54, April 9th to be exact, the fire alarm in our son’s room starting beeping, reminding me that it was time to change the battery. This sounds easy, right? Well when your brain is not functioning properly, this task becomes insanely difficult. First problem, it wouldn’t stop beeping! Do you have any idea how terribly irritating this is, and then you have to remove it from the ceiling, and the damn thing just beeps louder. Alright, it actually doesn’t beep louder, but now your ear is right up there while you are trying to get if off the ceiling which is no easy task. How to remove the fire alarm from the ceiling. Above is an image of my Twitter conversation regarding the horrible life saving fire alarm, and I did indeed find the largest screwdriver my husband owns to rip it off the ceiling. I am going to throw the fire alarm outside because of the non-stop beeping. 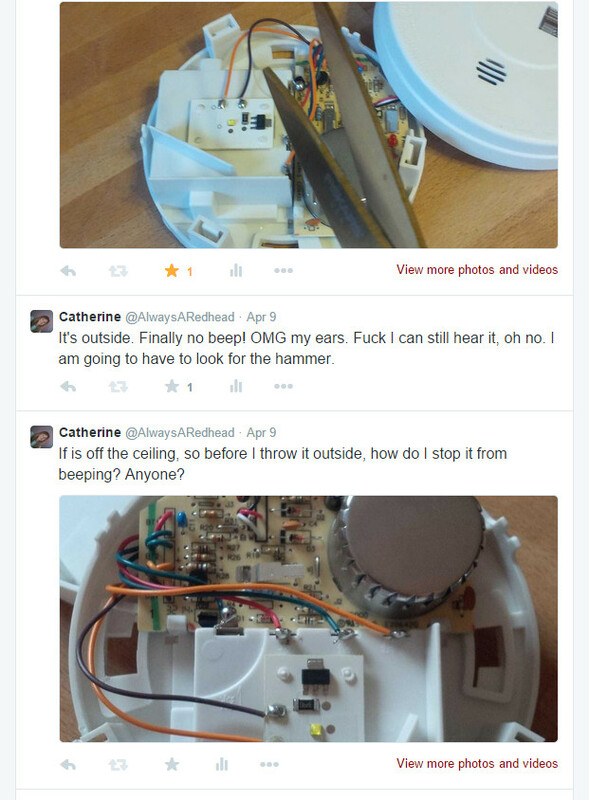 So throwing it outside did not solve the problem, I could still hear the beep. I brought it back into the house, and tried to figure out what to do. Honestly I did look for batteries in the fire alarm, I turned it over and in plain sight was the opening for the batteries, but I didn’t see it (fibro fog – perimenopause fog). I phoned my husband at work, who tried his damnest to convince me that there are batteries in this fire alarm, but I don’t believe him. For some reason I am convinced that it had its very own hard-wired mechanism making it beep. (I know now my logic was all wrong, but remember my brain was not working on all its cylinders). 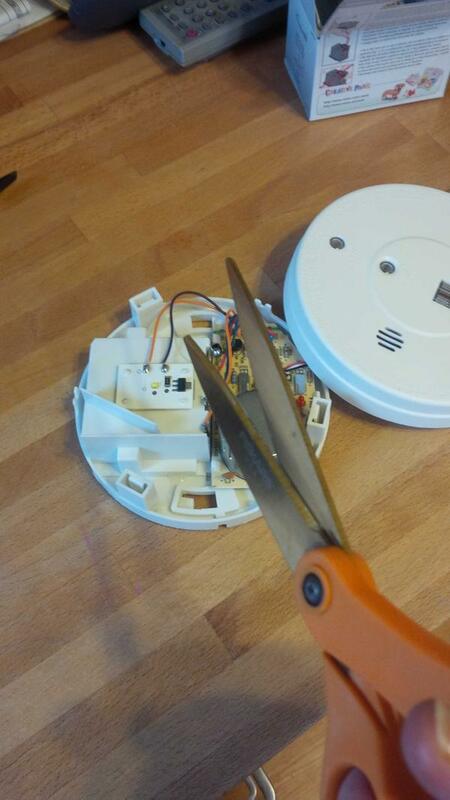 So realizing my husband is no help because he won’t believe my logic, I am determined to stop the beeping anyway I can – and I figure cutting the wires is my only choice. (My husband is telling me not to cut the wires because I would be ruining a perfect almost brand-new fire alarm, I don’t listen to him). I ended up cutting three wires – the red, white, and blue. 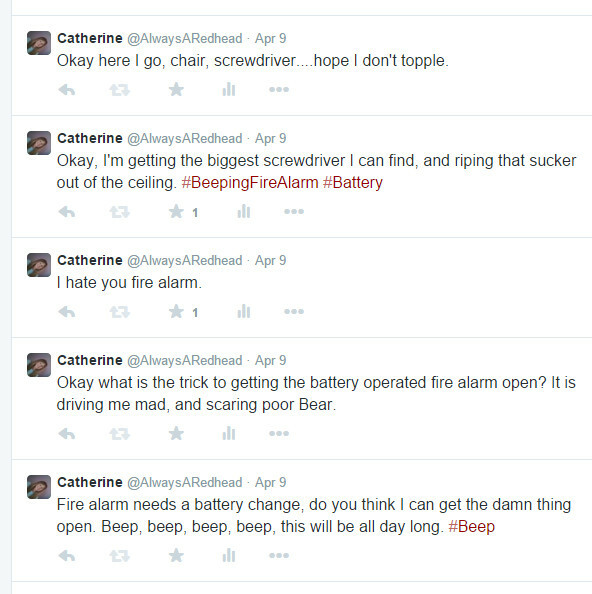 The beeping stopped. I was saved! Note: Even though I ruined a perfectly good fire alarm, which we now have to replace, there are still four fire alarms on the second floor. A hard-wired one in the hallway, and three battery operated alarms in the other bedrooms. This entry was posted in Batteries, Battery, Beeping, Fibro fog, Fibro-fog, Fibromyalgia, Fire Alarm, Hard-wired, Humour and tagged Memory, Memory, Perimenopause, perimenopause, Perimenopause Fog, Perimenopause-fog, Screwdriver, Short-term memory loss, Short-term memory loss, Smoke alarm, smoke alarm, Twitter, Women's Health on April 15, 2015 by AlwaysARedhead.